Kismet was the restaurant I was most looking forward to trying once I knew we were coming to Los Angeles. This all-day café is totally up my alley- the menu reimagines Middle Eastern flavors for modern-day California cuisine- so basically everything I want in a meal. Before relocating to LA, chefs Sara Kramer and Sarah Hymanson helmed the kitchen at Glasserie in Brooklyn, which is one of my husband's and my absolute favorite spots, so we had pretty high hopes for our meal at Kismet. 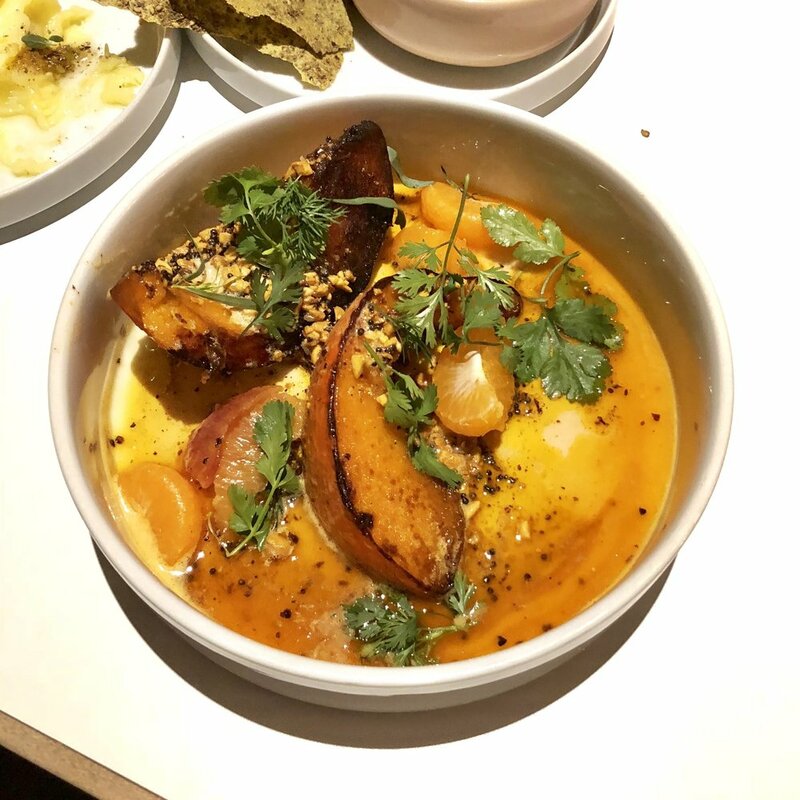 I can say we thoroughly enjoyed the food, and although there are some similarities to Glasserie in that they both have Middle Eastern influence, Kismet is its own delicious beast. I love their focus on using small, responsible growers, and how much they value creating personal relationships with the farmers and producers. This passion really comes through in the food, as every dish really allowed the ingredients to shine. My husband and I met another couple for dinner, so we luckily got to try a ton of different things, and honestly it would be hard for me to pick a favorite. The barbari bread by bub & grandmas was nicely doughy and chewy, but got even better when dunked into their super creamy tahini. Kismet creates some really flavorful combinations, like sweet potato with puffed rice and coconut vinaigrette, as well as kabocha squash with peanut and aleppo pepper, and I truly enjoyed all the unique flavors. Scroll through the slideshow to get details on all twelve (!) of our delicious dishes. I'm dying to return for brunch or lunch, as the Turkish-ish breakfast and broccoli toast are absolutely calling my name! The Kismet team also opened a more fast-casual falafel joint called Madcapra, so looks like I'll have to stop by Grand Central Market for lunch too!